Following Universal’s news that they’d be postponing the resumption of photography on Fast & Furious 7 due to the untimely death of star Paul Walker, effectively delaying the film from its originally announced July 11, 2014 release date, 20th Century Fox has decided to move their newest entry in the Planet of the Apes franchise up a week, from July 18, 2014 to that July 11th, giving it the sweet spot of a post-Fourth of July holiday weekend release. With Fast & Furious out of the early July window, the closest blockbuster competition for Dawn of the Planet of the Apes becomes a Paramount release: Transformers: Age of Extinction, which is out the last Friday in June (June 27, 2014). It almost seems fitting. 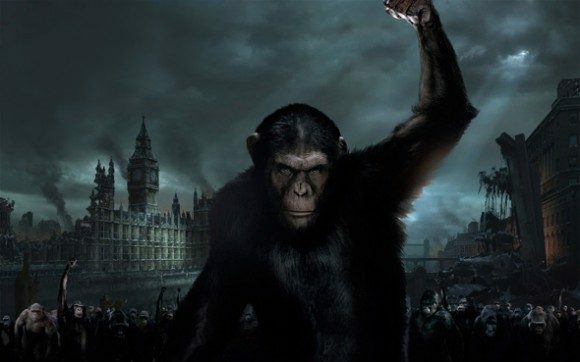 One film will feature the robots in taking on the form of ancient creatures, while the other will provide the missing link between 2011’s Rise of the Planet of the Apes and 1968 Charlton Heston-starring original that takes place in the future. As far as where Dawn fits on the timeline, it takes place years after the events of Rise, with Caesar’s (mo-cap master Andy Serkis reprising his role) burgeoning ape empire locked in an uneasy truce with humankind. Tensions, naturally, will be stretched to a breaking point. Gary Oldman (The Dark Knight Rises), Judy Greer (The Descendants), and Jason Clarke (Zero Dark Thirty) star. Right now, all of us at Universal are dedicated to providing support to Paul’s immediate family and our extended Fast & Furious family of cast, crew and filmmakers. At this time we feel it is our responsibility to shut down production on Fast & Furious 7 for a period of time so we can assess all options available to move forward with the franchise.